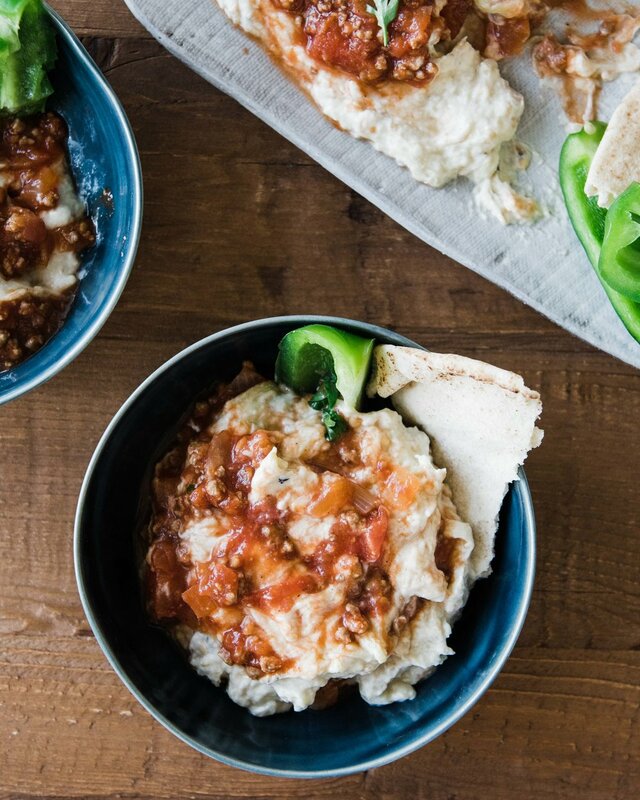 Today I’m sharing batersh, which is a creamy smoked eggplant dip with tomato meat sauce. This dish comes from Hama, which is a smaller city about 40 kilometers north of Homs (my parent’s hometown). This region is especially known for its sweet eggplants. A wide assortment of eggplant-based dishes come from Hama/Homs, and batersh is just one example. I was originally planning on posting this recipe in a couple of weeks, but I felt compelled to do it now. Earlier this week, we watched A Private War, the movie about Marie Colvin, who gave her life to reporting the truth about Homs in 2012. I remember Baba Amr, the battles and the brutal siege at that time. I remember hearing of civilians, women and children starving and dying. I remember the cries for help. I remember the desperation that Syrians felt for the outside world to hear their story. I wanted to post this recipe as a reminder to never forget Hama, never forget Homs and to never forget Marie Colvin. If you give a Hamwi batersh, it evokes very distinct memories of summertime and fresh eggplants and tomatoes. Batersh is not very familiar dish to those outside of Syria (maybe even to those outside of Hama/Homs), but it’s delicious, and it honors the seasonal and regional cuisine. You start off by making muttabal, or the creamy version of smoked eggplant dip. 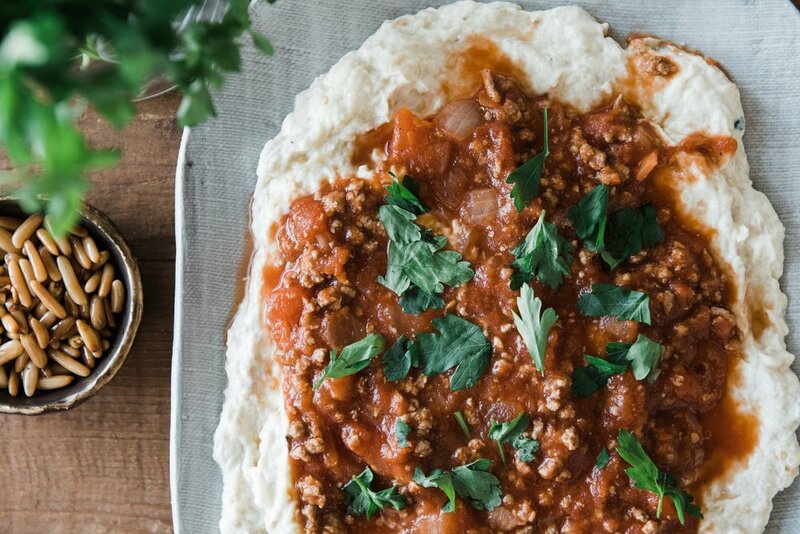 You’ll need labneh, or strained Greek yogurt, for that special texture. 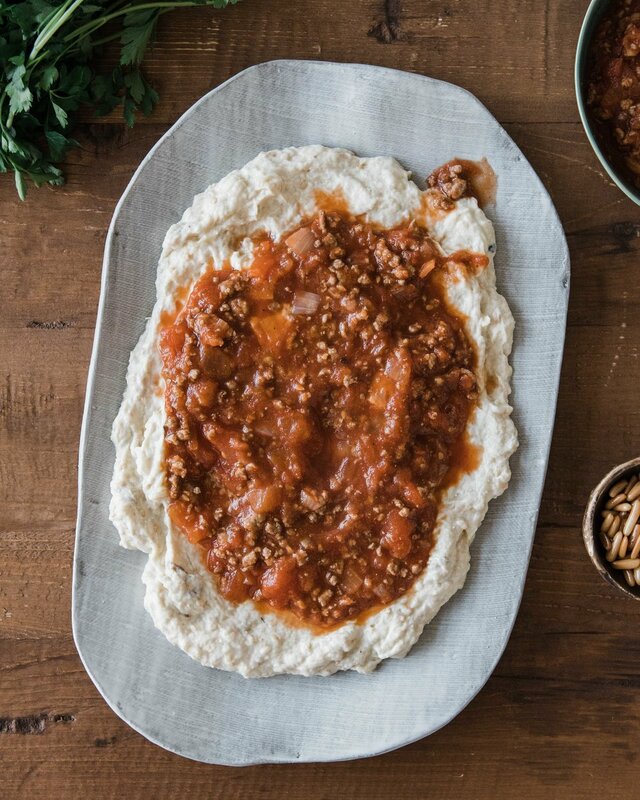 You also make a fresh, meaty tomato sauce and top it with pine nuts. The result? Sweet, delicious eggplant paired perfectly with the acidity of the hot tomato sauce and nutty pine nuts. 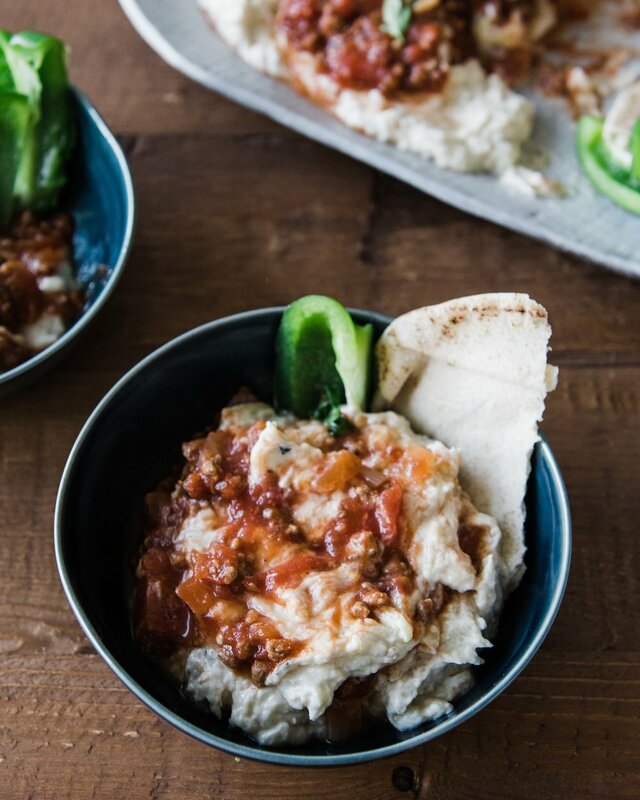 Syrians love to dip batersh with pita bread and alternate bites with green pepper. To get the best flavor, it’s important to start with fresh tomatoes for the sauce. At the grocery store I was lucky and caught one of the employees picking out the “overripe” tomatoes to discard. I went straight for those bad boys, because I know they’re the best for making sauce, but if you can’t find overripe tomatoes, any large tomatoes will do. You can serve the eggplant portion at room temperature, but make sure that the tomato sauce is HOT before serving. I hope you enjoy batersh! If you try the recipe, don’t forget to put it in the comments and tag @omayahatassi and #omayahcooks on Instagram. Take the scored tomatoes and blanch them in boiling water for no more than 1 minute. Transfer immediately to an ice bath and let cool, then peel and chop. Next, smoke the eggplants. Line a baking sheet with foil and place the pierced eggplants under the broiler for about 30 minutes, or until they're charred and collapsing, turning about every 10 minutes. When they're finished smoking, wrap the eggplants with the foil until cool enough to handle. Peel and discard the stem. Immediately transfer the eggplant to a colander set over the sink and sprinkle with salt to let drain for about an hour. Meanwhile, make the tomato sauce. In a large stockpot, place the peeled and chopped tomatoes over low heat. Cover and let simmer until the tomatoes break down and the liquid is absorbed, about 45 minutes. In the same skillet, increase the heat to high and add the ground beef. Season with the 7 spices and salt and pepper. Cook, stirring and breaking up the meat constantly so that it begins to look crumbly and well-browned. When the tomatoes are ready, add the can of tomato puree and stir to combine. Add the onions, the cooked ground beef and about 1-2 tsp of salt and cover again. Cook until the beef has absorbed most of the tomato liquid and the sauce has thickened, about 10 minutes. Adjust seasoning. Combine the drained eggplant, labneh and garlic in a medium bowl. Taste and add lemon juice if necessary*. Adjust seasoning. To serve, make sure the tomato sauce is very hot. Put a layer of the eggplant dip in a serving platter and spread evenly. Top with tomato sauce and garnish with parsley and pine nuts. Serve immediately with pita bread and green pepper. Both the eggplant and the tomato sauce can be stored separately in air-tight containers in the fridge up to 4 days. Before serving, bring the eggplant up to room temperature and reheat the tomato sauce over the stove. *The addition of lemon juice depends on the acidity of your labneh. My mom uses none, I used about 3 tablespoons.